Nowadays, as the number of people using interchangeable lens digital cameras increase, default combinations of camera lenses and bodies are no longer able to satisfy the increasingly sophisticated demands of the many photography enthusiasts. Nowadays, as the number of people using interchangeable lens digital cameras increase, default combinations of camera lenses and bodies are no longer able to satisfy the increasingly sophisticated demands of the many photography enthusiasts. The advent of lens adapters have given users full rein of customizing their equipment to best fulfill their needs through different combinations of lenses and camera bodies. However, although individual camera manufacturers have created their own customized adapters, lenses and camera bodies between different manufacturers can not be used directly. At KIPON, a world-renown camera adapter manufacturer, we have developed over 400 types of adapters. With our various adapters, we offer our users the freedom and compatibility of lenses and camera bodies that transcends different times and manufacturers. We have made possible not only the interchangeable use of products across brands but also the use of traditional film lenses. macro adapters, electronic adapters, adapters with built-in glass, optical focal reduction adapters, tilt adapters, shift adapters, tilt and shift adapters and more. 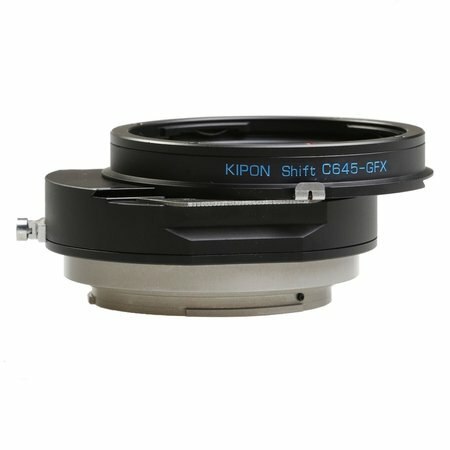 The KIPON Shift C645-GFX mounts Contax 645 series lenses onto Fuji GFX medium format camera bodies, please note that after mounting the adapter, while infinity focus is available, only manual mode will be accessible in shooting. This adapter features a 360°free rotation in addition to a fluid 15mm shifting function that provides the user with more compositional control. The shift function minimize any size distortions that may result from objects being seen an an angle. For instance, buildings can now maintain their even straight dimensions deposit the angle of photography. When located in its default resting position, the adapter can be used like any other standard non-shift adapter. A pin fixing the adapter to the lens also allows for aperture control from lens. To adjust the shift of the adapter, hold down the silver trigger and slide the moving component to desired length. Once adjusted, release the trigger to fix into place. All KIPON adapters undergo the CNC turning center procedure during manufacturing to provide our customers with only the utmost precision and quality. We guarantee an ideal fitting between cameras and lenses to maintain the ease and accuracy of photography. All adapters are made of brass and or aluminium alloy. Please note that not all camera models and lenses are compatible with this adapter. Please take extra care and notice when attempting to use any adapter with wide angle and fish eye lenses. Please contact a local dealer if you have any questions regarding compatibility.